Sonam kapoor chose to wear a Narendra Kumar Ahmed transparent cream Bengali Style Saree with gold and red embroidery across the border along with a heavy golden zari work full sleeved blouse with a stylish high neck. 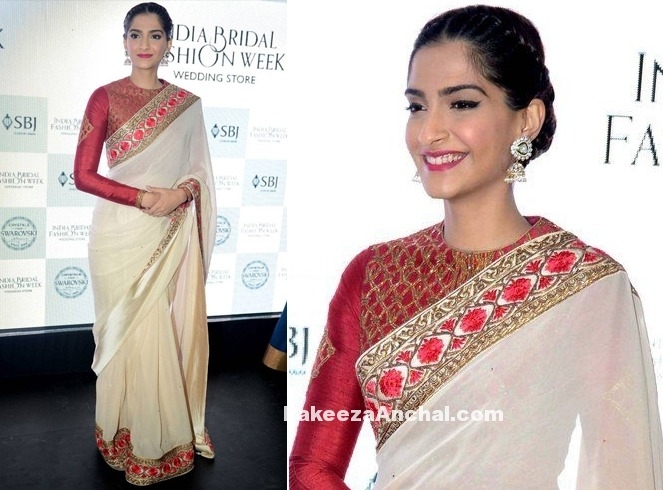 Sonam kapoor looked awesome in this attire with Sunita Kapoor Jhumkas, red lipstick and hair tied in braided bun style. Upcoming Model and Actress Tia Khalifa was seen in Chilli Red Chiffon Saree and Full Sleeved Netted transparent blouse during a photoshoot event. Tia Khalifa was wearing a Backless Blouse showing her full back and looked stunning in this attire. Karishma Kapoor looking as elegant as ever in a White Designer Wear Sabyasachi Saree with a high neck full sleeved Blouse during an event in Hyderabad. Saree was a plain white with thin green border with a floral print on the blouse. Hair tied back with a bun style and Big Jhumkas make her looked awesome. Karishma Kapoor looked beautiful and charming as always. She chose to wear a full sleeves plain white Blouse along with a Black Designer Saree designed by Sabyasachi with a Mangalustra style neckpiece. She tied her hair back in a bun with red lips during the TOIFA 2016. Actress Rakul Preet Singh wearing a Light Pink Net Saree embellished with shimmer and glittering work. Paired it with a Printed Blouse with full sleeves during the IIFA Utsavam Awards 2016 designed by Sidhhartha Tytler. With Maithili Kabre Jewellery and Gold clutch by Anandita and nice hairstyle made her look classy. Bollywood Actress Katrina Kaif wearing a Traditional Saree designed by Sabyasachi in 2016. promoting her film Fitoor. She was along with Aditya Roy Kapoor at the Kala Ghoda festival and celebrated the Make in India week. Sabyasachi Saree worn by Katrina was a white Saree along with full sleeveless blouse with black patterns with a Gujrati style drape. I was embellished with Gold embroidery and sequin work. 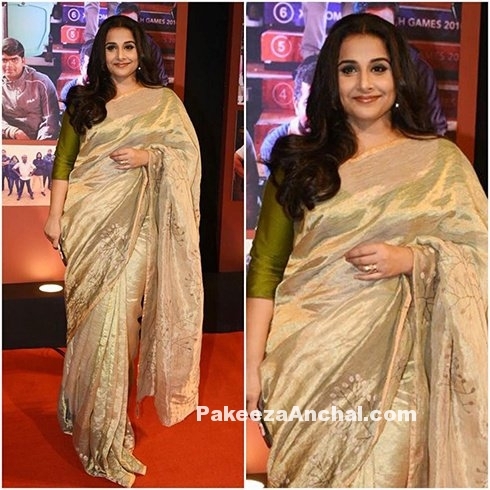 She paired the Saree with kundan Jewelry by Amrapali and a wavy hairstyle for the event. Bollywood Star Actress Sonal Chauhan wearing a Full sleeved Blouse type Choli with a matching Red Lehenga embellished with Gold work embroidery designed by Jayanthi Reddy during the special screening of Size Zero movie. Sonal Chauhan was wearing Lehenga in such a way to show her beautiful Navel with straightened hairstyle. She was present with Anushka Shetty during the screening of Size Zero movie. Srilankan Model and Bollywood Actress Jacqueline Fernandez wearing a cream colored Silk Saree with Bengali Style Drape and a Sequined Gold Double border Saree with a Full sleeved Long jacket in Gold. She was also carrying a matching Clutch in Gold and Golden Sandals during the Star Guild Awards 2015. Shraddha kapoor draped in Navy blue Satin Saree embellished with Golden Floral design Patch work across the pallu with a golden border. Shraddha Kapoor in Designer Saree embellished with Lace, Resham work, patch border and stones. 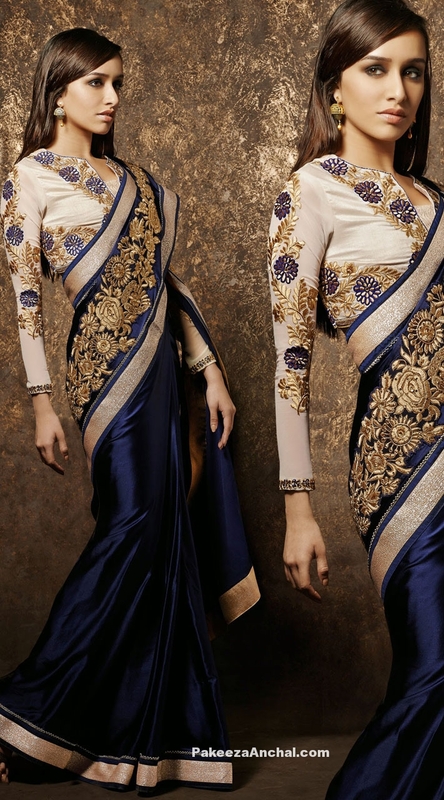 Paired it with a Full sleeved open style blouse embellished with Gold and navy blue heavy embroidery work.